I’ve been making pancakes for as long as I can remember. It always seemed really easy. Mix flour, baking powder, milk and eggs and you’ve got pancakes. I’ve never really given them that much thought and truth be told, I’ve never been all that crazy about pancakes. Sure, it’s a nice breakfast treat once in a while, but I’d pretty much choose most breakfast items over pancakes any day. Pancakes can be too doughy, too gummy or too…meh! Pancakes seem really easy but I’ve seldom reached pancake perfection. I’ve tried my best and have usually done okay by adding in things like apples, cornmeal and cocoa and cinnamon. But true pancake perfection? A plain ol’ wonderful naked pancake? Sadly, not until now. A few weeks ago for Shrove Tuesday, I tried my hand at pancakes. Somehow with this perfect mix of ingredients (the flour, the eggs, the milk along with a few other try-ins), made golden and fluffy and light pancakes. 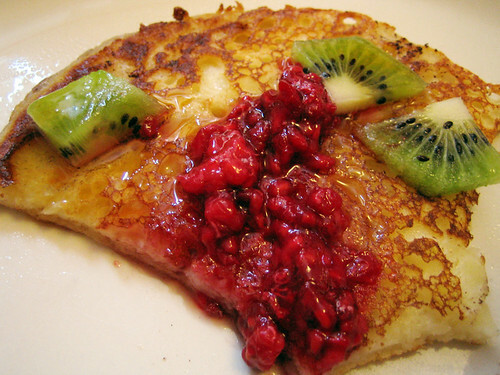 They tasted lovely on their own….but I couldn’t help but pad the perfection with some fresh kiwi slices, raspberries and a dollop of maple syrup. I had reached the nirvana of pancakes and I was proud. I tried out my recipe again this morning, this time dropping in a few blackberries into each unturned pancake. Yum. Who can argue with perfection? Not me. 1. In a large bowl, stir together the flours, baking powder, baking soda and salt. Add in the milk, yogurt, eggs and vanilla, if using. Whisk until smooth. Let sit 5 minutes. 2. Heat a large pan over medium high heat. Add 1 t of oil or butter and shake it about the pan until it’s evenly distributed. Ladle in batter to your preferred pancake size. Add in any fruit if using. When you see bubbles forming on top after about 2 minutes, flip and cook until evenly browned, about 2 minutes longer. Serve with fresh fruit and maple syrup. We don’t make pancakes very often but when we do it’s a really big event. Adding blueberries is his signature. But raspberries work just as nicely. Hot bursts of sweetness. You almost don’t need the maple syrup. A few years back while vacationing in Maine, we drove through Vermont and stopped for breakfast at a roadside breakfast place. They had a “stuffed” pancake on the menu. I had to try it. The pancake was stuffed with apples and Vermont maple cream. It was so good, hearty and very decadent. I just couldn’t finish it all. I’d go back in a heartbeat to Vermont for those maple cream stuffed pancakes. Yum! i like buckwheat pancakes with nuts added (usually walnuts. ), topped with real butter and real maple syrup. in fact i am getting ready to make some now. summer before last, i used to make pancakes everyday until i had perfected the technique. then i stopped. thanks for the recipe. i wiill try it another day as i am currently craving the buckwheat pancakes! joanne, pancakes and fruit go so well together! i’ve been eating a lot of raspberries and blackberries lately as i’m trying to empty my freezer before the move. those maple cream pancakes sound just lovely! m, i’ve never thought to adding nuts to pancakes! yes, i’ll bet walnuts would be great. brilynn, with these pancakes, i might have to agree with you! haha jen! funny how pictures can do that to you! i’m the same way. I tried your pancake recipe for supper last night. Possibly the best pancakes I’ve had (aside from the ones stuffed with ricotta at a restaurant in Ottawa). Pancakes are probably my favorite food aside from creme brulee. I’ll be making these again on the weekend with a bowl of cafe au lait, a kitten, a cute boy, and the newspaper. I was woken early this Saturday morning by a phone call from my friend telling me (not asking) that she and her boyfriend were coming over and they were bringing pancake mix! max, chocolate chips in a pancake seems almost sinful. at least you had some fruit to balance things out! I made these for my birthday breakfast with dark chocolate chips. They really are just simply amazing. Best pancakes I have ever made. Thanks. I accidentally discovered how to make them extra light and fluffy- we some mixture left over so I put it in the fridge for next day’s breakfast. It was even better. Seriously, if your breakfast planning is up to it, make the batter the night before! i just made these. so perfect.they actually come out looking like the photo. and very much like pancakes. i let them stand for about 4min and then put them in the fridge for about 5. i ate them with this divine blueberry lemon sauce which i made with 2 cups of frozen blueberries, juice and zest of half a lemon, 1/8 and a bit cups of sugar, and a teaspoon of cornflour mixed with a dash of water. unbelievable. go try it.